Oregon Recruiting, Pac-12 Notes and Coug-It, USA! In the aftermath of signing day, as we try to make sense of it all, I compiled a chart (see below) covering the past twelve years of Oregon recruiting to help put things in perspective—from the end of the Mike Bellotti era to the beginning of the Mario Cristobal regime. At first glance, it’s clear that things took a dip during Mark Helfrich‘s time. Of course, one has to consider how much blame falls on Helfrich, and how much falls on the recruiting penalties instilled after the Willie Lyles “scandal” (And what’s the deal with guys named Willie?). 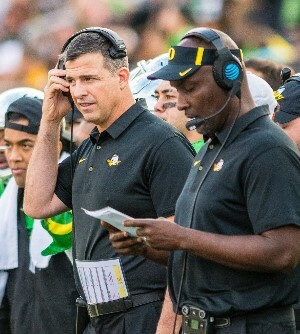 But it is telling that, under Helfrich, recruiting dipped down after highly successful campaigns, while the past couple years under Taggart/Cristobal, the Ducks have recruited very well coming off sub-par seasons. 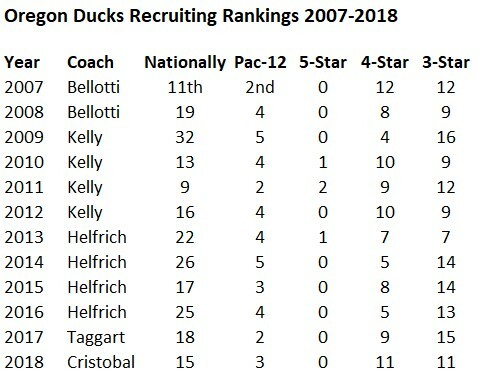 Which makes one wonder how just how far down the Ducks would be in the recruiting rankings if Helfrich was still in charge. 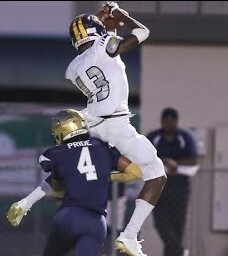 Rankings are from Rivals.com. Pac-12 ranking includes Utah and Colorado before they joined the conference in 2011. One nice shift for the Ducks this year was how well they recruited at the offensive line positions. For years, Duck fans had been brainwashed (me being one of them) into believing it was a disadvantage to recruit to Eugene, especially when seeking top-notch talent in the trenches. We believed the Ducks had to run a “gimmicky” offense to hide their smaller and less physical lineman. And while the Ducks will never be able to match the likes of the Trojans and Longhorns of the world when it comes to recruiting the hogs up front, we can do much better than we had always thought. For that—as I’ve done before—I give credit to Taggart, and Cristobal has continued this shift in mentality. Just look a this year’s haul up front. 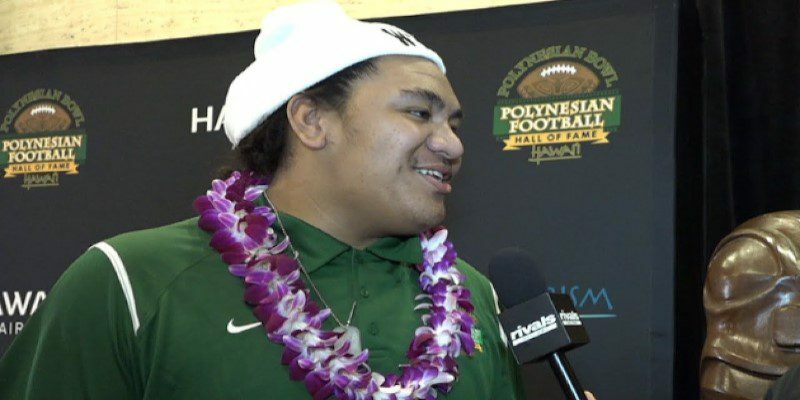 The Ducks brought in three four-star and two three-star lineman, all of them at least 6-foot-5 and weighing in at over 300 pounds. The star of the bunch is Penei Sewell (top photo), rated by Rivals as the No. 5 tackle and rated as the No. 2 guard by 247Sports. I think of Nebraska, another state without much local talent, yet a program known for large and physical lineman. If they go to Lincoln, why not Eugene? Of course, Nebraska is a traditional blue-blood and has always put an emphasis on recruiting big lineman. The Ducks have done enough winning in recent years to put that excuse to rest. The only thing lacking in past recruiting seasons was the emphasis on the line, and now we have that with Cristobal. The Oregon staff brought in a solid recruiting class. A) With the conference having a down year in 2017, to say nothing of the disastrous bowl season, it is paramount that the Pac-12 keep local talent local. In December, six of the top-25 players in the west signed outside the Pac-12. Eight more were uncommitted coming into last Wednesday’s signing day, and fortunately, all eight signed with Pac-12 schools. B) Per 247Sports, USC led the conference with four five-star recruits. In fact, the Trojans have signed more five-star recruits over the past five years than the rest of the conference combined, 14 to 11. C) The Pac-12 scored four top-25 classes (per 247Sports): USC (4), Washington (13), Oregon (16), and UCLA (18). Ideally, you’d like to see the conference land at least five to equate their fair share among the Power-Five. It should be noted that Stanford (39) had a top-25 class as far as talent, but were dropped down in the rankings due to the small size of their class. When looking at the two “little brother” schools tucked away here in the Pacific Northwest, I’ve always viewed OSU as the likable little train that could. The benign little brother, who, even as our natural rival, is a team I’ve sensed Duck fans tend to root for as long as a Beaver victory doesn’t negatively affect the Ducks. I used to hold similar feelings about the Cougars. It used to be that “Couging-it” meant blowing a game late, referring to WSU’s God-given talent of snatching defeat from the jaws of victory. The Ducks, Cougars, and Beavers used to be a little band of brothers tucked away in this outlying region of the country. They were all smaller schools, underfunded, with not much local talent. They bonded together over their common mediocrity and underdog status. (I went more in depth here). Isaah Crocker: 4-star recruit should make a solid target for Justin Herbert. As history goes, of course, the Ducks broke from the “poor me” mentality long ago and decided to rise above. Sure Phil Knight was our Daddy Warbucks, and there is nothing wrong with that. The Ducks broke away from skid-row and moved into a much nicer area of town, while the Cougars remained behind. The “brotherhood” now broken, the Cougars transformed their self-loathing attitude into hate for the Ducks out of pure jealousy. But as of late, mostly due to run-ins with the law, “Couging-it” has shifted from the realm of sports into the game of life, and this latest version of Couging-it is one of titanic proportions. WSU linebacker Logan Tago was awarded the Fall 2017 CCE Community Involvement Award for dedicating 240 hours to his community in order to make the world a better place. When you think about how tight his schedule must have been (considering he was a full-time student athlete), it’s utterly remarkable what this beacon of light at WSU was able to accomplish. I mean, after all, 240 hours is the equivalent to ten full days, 30 eight-hour work shifts or however long it took me to run my last 10k race. The point is, it’s a hell of a lot of time to donate out the kindness of one’s heart. You see, it turns out the 240 hours was actually part of a court-ordered plea bargain in order to get a felony assault charge reduced to a misdemeanor. (See here). And for this, the WSU administration, the “adults” in charge, gave him an award for outstanding citizenship. … Better known as Coug-It, USA!